Dèesse Magazine: Please READ...and Be GORGEOUS!!!!! 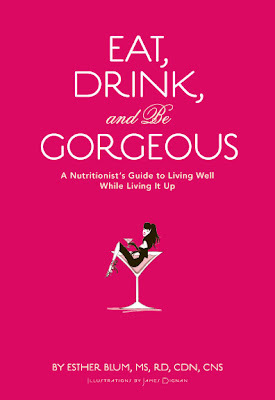 This book give us gals great tips on being healthy, but with a fabulous diva twist , One of my many favorite tips in the book are these recipes to Mocktails (non-Alcoholic cocktails) which will come in handy for Pregnant women, non-Alcohol drinkers, and your younger friends/ family members. I love the fact that Esther highlights one important idea, that we tend to lost sight of some times in this crazy world - we don't have to stop having fun and doing the what we love most, just because we want to Live Well . We just have to go the RIGHT way about it all. Go green......Juicing, that is. The spring is an excellent time of year to "clean house" internally. Think about downing a 1-ounce shot of freshly juiced wheatgrass daily. Not only will you clean up your skin and your digestive system, but you'll also give yourself loads of natural energy, sans coffee! And guess what else--your PMS will also become a thing of the past. Add some pounds to your bod.That's right, every girl needs extra pounds on her bod...in the form of dumbbells! Hustle on over to the gym (you'll stay more motivated and focused than trying to work out at home) and start pumping iron for thirty minutes three times per week. It is the fastest and most effective way to build bone density and muscle while burning body fat--even at rest. Get in bed.To regulate your hormonal balance and improve your energy and mental focus, try to head to bed the same time each night. Our bodies crave routine and regularity, and getting enough sleep is a surefire way to keep your immune system humming. Sleep in a room that is as dark as possible so that your body naturally makes enough melatonin for restorative rest. If you have a naturally bright room thanks to outside lighting, pop a mask over your eyes. Also check out Chronicle Books to purchase your own copy of EDG ! Interesting.... I got to look into the wheat grass . 9:52-you sure need to holla at some wheatgrass!!! Its all of that!